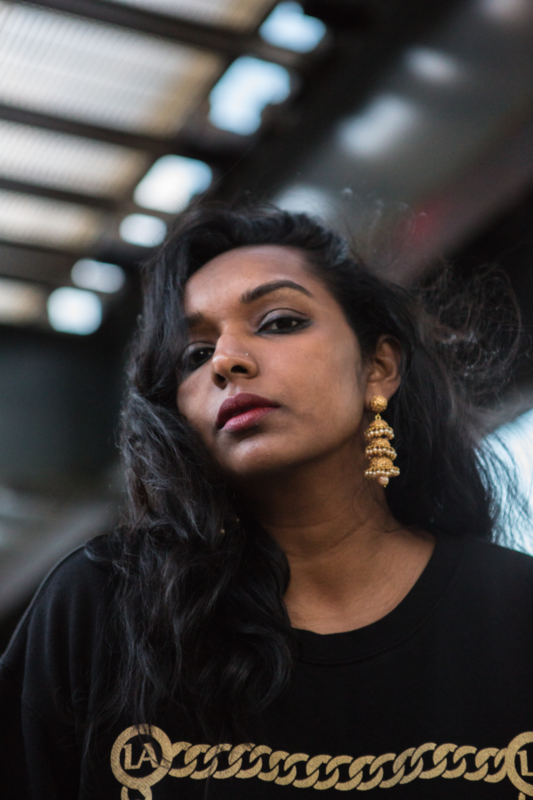 Thanushka (Thanu) Yakupitiyage is a Sri Lankan-born, Thailand-raised, Brooklyn-based multidisciplinary artist, cultural producer, activist, and DJ who performs under the name Ushka. Her professional, political, and artistic interests focus on (im)migration. She uses writing, video, music, and audio to explore the everyday lives of brown and black communities from the Global South to the West. Yakupitiyage has worked as a storyteller and organizer in the immigrant rights movement for a decade and now does intersectional work in climate justice. As a DJ, she’s known for her genre-blending style across electronic club and bass music that deliberately traverses borders, creating soundscapes that reflect the immigrant experience in global migrant cities. Since 2013, Ushka has thrown a QT/POC and immigrant-centered global club party called iBomba. She has performed at venues including the Brooklyn Museum, MoMA PS1, American Museum of Natural History, Rubin Museum of Art, Queens Museum, and Harbourfront Center Toronto. She uses DJing and cultural organizing as a means of crafting intentional spaces and fostering community building. She works and performs with a wide community of DJs and producers with the philosophy that artistic and cultural production, at its best, is a collaborative process. She holds degrees from Hampshire College and the University of Massachusetts, Amherst. You can find her work at thanushka.com, and on social media at @ty_ushka. I am honored to be the A/P/A Institute at NYU’s Artist-in-Residence for the 2018-19 academic year. This opportunity could not be more perfectly timed as I advance my artistic practices, further bringing together my interests in sound culture, immigration and climate justice, and the possibilities offered by artistic and cultural production to push beyond borders and restrictive policies. While the State escalates deportations, expands detention facilities, and broadens investments at the southern border, and with rollbacks threatening existing policies meant to address climate change, health care, LGBTQ rights, and more—I want to explore this “new normal” and the role of artist-activists within it. During my residency, I plan to bring artists and activists together in conversations about disruption, dignity, sanctuary, and daily acts of resistance. In particular, I look forward to curating a program for Carnegie Hall’s festival “Migrations: The Making of America” in Spring 2019. I will also use this time to continue to learn new audio production and media making skills, expanding my art as a DJ to explore podcasting and the creation of soundscapes and original productions. Inspired by a recent collaboration I was a part of for the exhibition Mel Chin: All Over the Place, I want to explore musical productions that use audio, both recorded and online, to create soundscapes that reflect the immigrant experience. I see this project as a sound exploration of what migrant communities look like in political crisis. For Asian/Pacific American and other diasporic communities, grassroots visionaries have been as essential to the making of culture as they have been for political organizing. Many observers have described our current moment as one of resurgent, and mostly conservative, populism around the globe. But we should keep in mind that popular movements have also struggled against racism and xenophobia, seeking dignity for immigrants, people of color, queer folks, and many others in the United States and across the world. 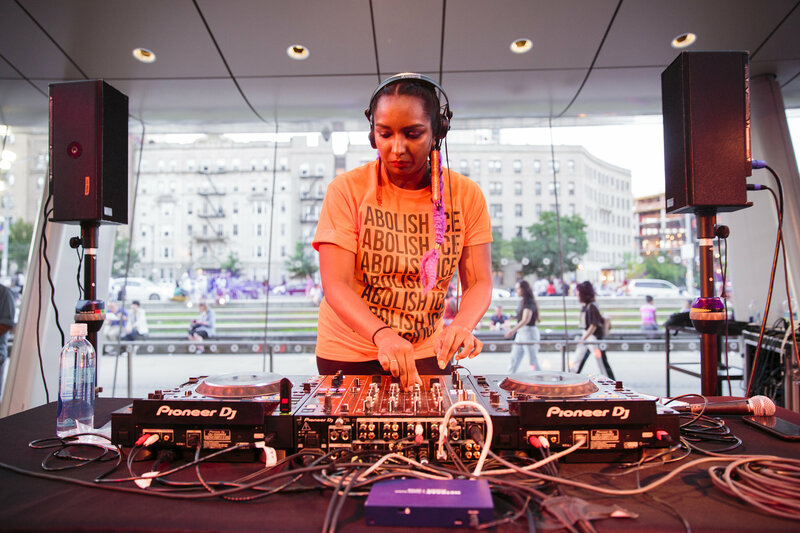 In her work as a DJ and as an activist, Thanushka Yakupitiyage brings sound, music, lyrics, and movement to bear on struggles for immigrant rights, climate justice, and a host of other progressive causes. Talented at translating her critical politics into sociable art forms and vice-versa, Yakupitiyage has worked with the New York Immigration Coalition, 350.org, and diverse New York City clubs and events. Bringing with her a sensibility that is at once attuned to the needs of local communities but also informed by cultural practices from across the globe, Ushka, as she’s also known, forges much needed solidarity across many borders. The A/P/A Institute at NYU is delighted to welcome Thanu Yakupitiyage as its Artist-in-Residence for the 2018-19 academic year. Tuesday, September 25, 2018, 6:30-8:30 p.m.
Tuesday, February 26, 2019, 6:30-8:30 p.m.
Friday, April 12, 6:30 p.m.-4:00 a.m.
Photo featured on homepage by Fabian Gomez.